The bald eagle in Arizona has experienced a large population increase since the species was listed under the Endangered Species Act in 1978. At that time, only 11 breeding pairs had been identified. Since then, multiple studies and intensive management projects have contributed to our knowledge of the bald eagle in Arizona, and the population has grown. This growth, not only in Arizona but nationwide, prompted the U.S. 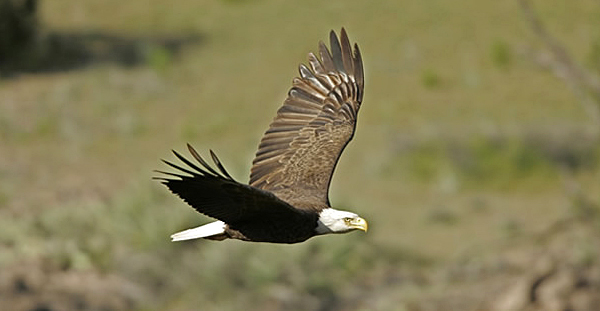 Fish and Wildlife Service to remove the bald eagle from the Endangered Species Act in 2007. However, continuing threats to the population in the southwest require the continuation of protective management actions. These actions are coordinated by the Southwestern Bald Eagle Management Committee, and implemented through the Arizona Game and Fish Department. Some of the management actions include: winter count, occupancy and reproductive assessment flights, nest survey, nest watch program, demographic studies and monofilament recovery program. In 2008, a federal court order returned bald eagles living in parts of Arizona to the endangered species list until the U.S. Fish and Wildlife Service could complete a status review of the species. In 2010, the U.S. Fish and Wildlife Service decided that bald eagles in Arizona are not a separate and distinct population that needs protection under the Endangered Species Act (ESA), and the species in Arizona was officially removed from the Endangered Species List the following year. Although the Arizona Game and Fish Department supports classifying the population as a distinct population segment for biological reasons, it supports removing the species in the Sonoran Desert from the list due to the existence of the Bald and Golden Eagle Protection Act and the comprehensive bald eagle management program led by Game and Fish. The department will continue to manage the population as it successfully has in the past by implementing the strategies identified in the Conservation Assessment and Strategy for the Bald Eagle in Arizona. These strategies are proven to help protect and increase the bald eagle population in Arizona.